The Mediterranean communicates with the Black Sea via the small inland sea of Marmar, with the Straits of the Bosphorus to the North and the Dardanelles to the South. Istanbul is built on either side of the Bosphorus linked by two suspension bridges; it is thus partly in Europe and partly in Asia. It has been variously called the Marvel of History and the Queen of Cities, and can justifiably be looked upon as the centre of the Old World. It was successively capital of the Roman, Byzantine and Ottoman Empires, being the seat of one hundred and twenty-two Ottoman Emperors, and still retains much of the ancient splendour in its mosques, museums and remarkable views. However, in contemporary Istanbul, it is a unique experience just crossing the road, the trauma being usually more mental than physical. The group was treated to humus, vine leaves, meatballs, kebabs, gooey sweets (with or without nuts), raki, bazaats, and bargains (so we were told, although we might never find out). Our thanks to Mehmet Kurtoglu, a local surgeon who had spent some time with JSPL at Barts, for his help with the visit. The opening concert was in the New Concert Hall, a well-equipped, modern building, highly-efficient apart from its toilet locks (we almost left Ally Knapp behind to putrefy). The concert included the Spring Symphony and Elgar’s Bavarian Highlands. Another concert was given in the University to an enthusiastic audience who wished to know everything about English medicineand England. The White Pavilion, hidden in the woods to the north of the city, was the elegant venue for performances by various BAFCO groups. 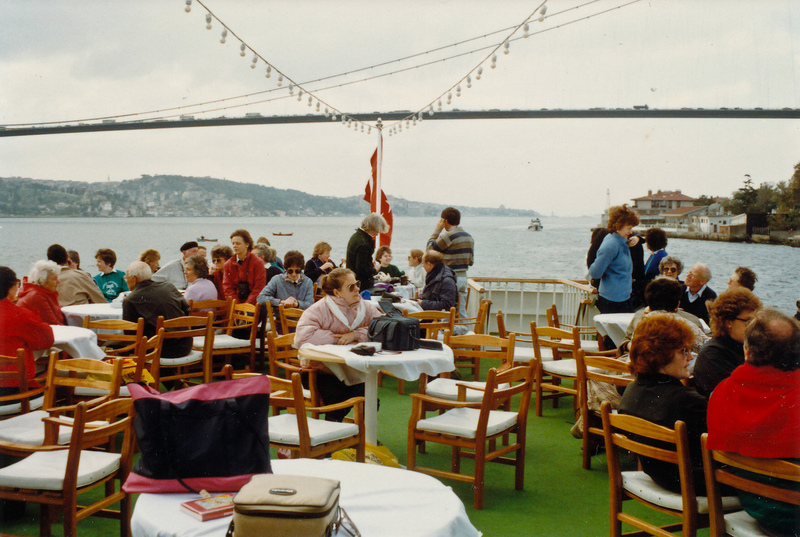 The trip will be remembered for the boat ride up the Bosphorus, the unique historical links, the Blue Mosque, and in the Topkapi Palace, artefacts which included the hair of Mohammed Suleimaniye, and the occiput of John the Baptist.